Club Car is offering its latest transportation solutions through a new series of Fit-to-Task Vehicles. “Now, rather than buying generic utility vehicles and adding accessories or make-shift attachments, you can order vehicles fully equipped for the task at hand,” says Portfolio Director Brant Mitchell. Each vehicle arrives configured with the equipment needed for a specific application based on an analysis of global buying patterns for cars used for that intended job. The vehicles slash costs, speed productivity and simplify ordering. And they help users switch from expensive full-size vehicles to inexpensive utility vehicles. All are built on proven Carryall® utility or transport vehicle platforms. Four of the vehicles will be on display at Club Car’s Booth 2309 of the 2017 NFMT Conference and Expo in Baltimore, Md., March 7 – 9. This time-saver comes with dual locking tool boxes, a dual ladder rack with tie-downs, a two-inch receiver for hauling and more. It equips skilled craftspeople for better workflow and higher productivity and helps prevents lost time and needless round trips. 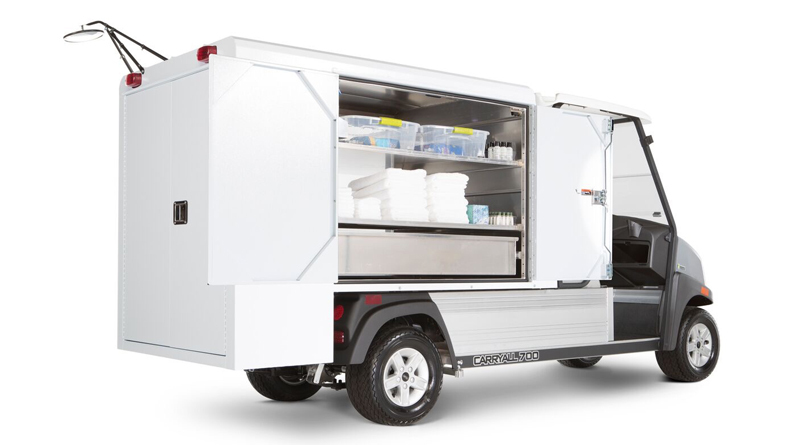 Configured specifically for timely food service, this vehicle features a van box with a 68-tray rack system, a 10-shelf rack system, glass racks, drip edges and more. It speeds food delivery, keeps guests happy and cuts costs. This vehicle streamlines housekeeping with an L-shaped van box with interior LED lights and locking doors. The box carries a full-sized vacuum cleaner, brooms, mops and other supplies. Drawers hold small items, and shelves carry towels, linens and cleaning supplies. With its small profile and maneuverability, Club Car’s new Transporter™ Ambulance accesses tight, crowded spaces and expedites care. The ambulance seats three, including a medical attendant. Its custom ambulance deck system comes with a hand-carry stretcher and mounts, fold-down rail for patient area, storage boxes and more. “All of our Fit-to-Task vehicles are also available in other configurations,” Mitchell says. Purpose-built for work, they are available with gasoline or electric powertrains, feature rust-proof aluminum frames and boxes, and carry one of the best warranties in the industry. Visit www.clubcardealer.com to find your local Authorized Club Car Dealer and learn more.